Indicative price, the final cost could be clarified during the negotiations. Appointment setting: Getting disinfecting agent (sodium hypochlorite) by electrolysis of sodium chloride solution. Sodium hypochlorite is used to disinfect drinking water, wastewater, process water and swimming pools. - Node of a solution of salt, which contains tanks, made of PVC or stainless steel and flow solution of salt and water. - The electrolytic cell consisting of a cylindrical electrolytic chamber and placed it in a package of electrodes. complete with a voltmeter and an ammeter. 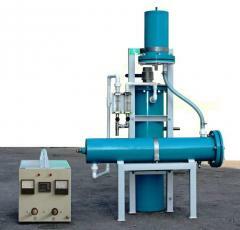 - Gas separator. It is established by the cell and is designed to separate electrolysis gases produced by the hypochlorite solution, and removing them to the atmosphere. 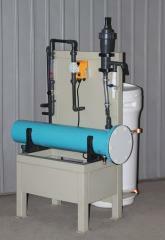 Electrolysis system allows for disinfection of drinking water and waste water disinfection with maximum quality. The most effective way to disinfect water - disinfection with sodium hypochlorite. Sodium hypochlorite produced in the cell, allows for disinfection of water as efficiently as does the liquid chlorine, but unlike chlorine bleach does not have toxic properties, when used correctly. Ready to purchase sodium hypochlorite is not reasonable. Most advantageous to obtain sodium hypochlorite on-site consumption by electrolysis facility, which can significantly reduce the cost of water disinfection. In addition, on-site hypochlorite getting safer to use, because in the long term storage of sodium hypochlorite decomposes with the release of chlorine and oxygen. The resulting sodium hypochlorite is practically non-toxic and highly effective. Therefore disinfection takes place in accordance with the relevant requirements and standards of hygienic water. Applying for water treatment and wastewater treatment plants modular electrolysis-sterilizers "Flame-2", you decide problemmu disinfection forever. Number of staff - one person. Period of production (in the absence on Slade) to 1 month from the date of payment. Number of cassettes to install - 1 pc. 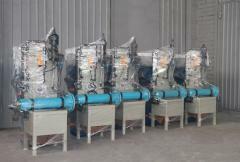 Unbelievable price on Modular electrolysis plant disinfection with sodium hypochlorite "Plamya-2" capacity of 5 kg. chlorine per day. For disinfection of drinking water, wastewater, and process water pools, a water chlorination, manufactured BORTEK, Borispol, Ukraine in Borispol (Ukraine) company Bortek, OOO.